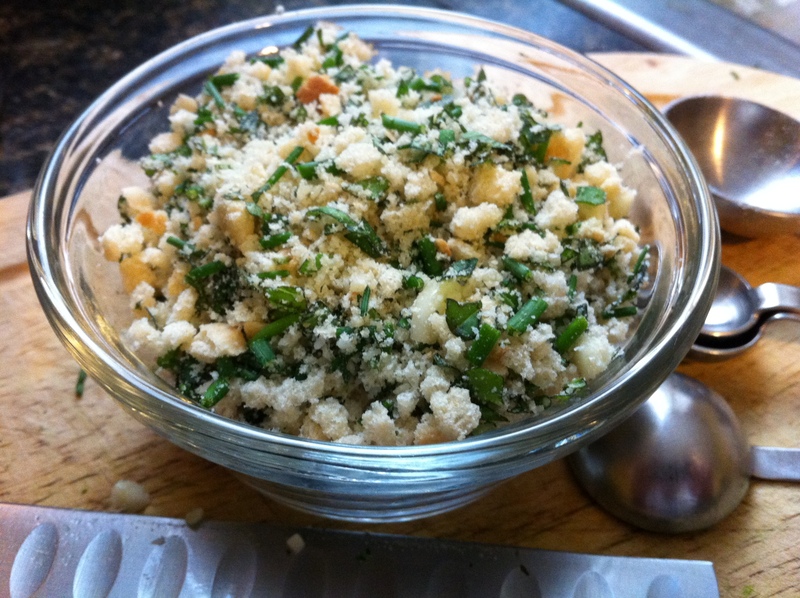 Our homemade Italian Breadcrumbs take only minutes to prepare and infuse any dish you use them in with tons of flavor. These days, I’m concerned about what my family eats. As a label reader, I often find that prepared foods like soups, pasta sauces and even breads contain things like high fructose corn syrup, hydrogenated oils and tons of sodium. That is one of the primary reasons that I’m always looking for ways to prepare my own version of store bought ingredients like these Italian Breadcrumbs. Not only do I have control over what goes into my food, but my homemade version packs a ton of flavor and makes every recipe I use it in taste better. I start by purchasing day old bread from my baker, slicing it and placing it on a baking sheet in the oven on low heat until it is dried out. Then, I simply put the bread in a food processor and pulse until there are only crumbs left. Finally, I add my own fresh ingredients as indicated below. Using your hands, combine all ingredients in a small bowl until well blended. TIPS: Any type of bread will work for this recipe. I’ve used day-old breads, rolls, and even hot dog buns to make my breadcrumbs. Regular breadcrumbs may be kept in a zip-top plastic bag or sealed container for up to a month. For the Italian Breadcrumbs, however, we recommend making this recipe no more than a day before you will use them.